We came upon this interesting infographic that may help drive home the point on why treating and managing rosacea is more of a integrated whole body technique. We know that rosacea involves the vascular system, nerves and skin right? After reading the below infographic you will see why its important to address rosacea from both an internal prospective as well as integrating a external component. Digest this infographic to see why addressing and treating rosacea’s vascular component from the inside is a important addition to helping you manage rosacea flushing, redness and more. The information help with understanding that rosacea has both a internal and external component. Helps to demonstrate why a integrated approach to treating rosacea is necessary. 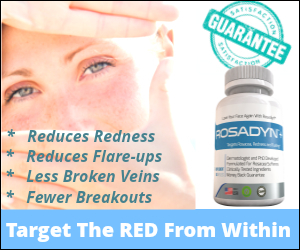 This is especially true for rosacea subtypes 2 and beyond as the vascular system plays a huge roll in delivering rosacea’s most annoying symptoms, redness, flushing, burning and swelling. So only treating superficially with temporary redness reducers does nothing to get at the root cause of rosacea which begins from inside the body. Also to begin to foster the rosacea community, where sharing, participating and discovery of helpful rosacea treatment, news and studies are shared and conversations begin.